Every so often I get an email from a reader who just pours love and encouragement into my life. I can’t even tell you how much this means to me. I want to share a letter from a guy who loved the book. Yes, a guy. This was my first letter from a guy, and I have been praying for him ever since. The thing was that I almost deleted this email before I read it. I almost missed this email. I thought it was spam or something because the subject was GTMTOY. But he was abbreviating the title of my book! Once I figured it out, it was so so so sweet. Please read on to hear a little bit of this brother’s precious heart. My name is Benjamin and though I was born in America, I’ve lived almost my whole life in Spain. So, I’m this 17-year-old missionary kid living in Mexico who’s searching for Christian fiction in Smashwords and … BOOM! I find Goodnight to My Thoughts of You by Chelsea Rotunno. I just ended it a few moments ago! Wow! 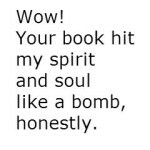 Your book hit my spirit and soul like a bomb, honestly. At first, I thought I was simply going to read Christian romance but then I found this was one of those books God uses to talk to you, so I better read it all soon. I’m a guy and I think this book should be read by both groups of young men and women whose desire is to find God’s love and holiness in order to wait for the one He has prepared for you. I identified with Charlie’s character. His weaknesses and affinities are pretty related to mine. Miriam’s situation with her mom made me think also I should value more my parents’ counsel. Her dreams about her future and how she learns to walk through the valley of the shadow encouraged me. Now I want to know what I can give to God instead of what should I have received. I just want to end saying that the most tremendous thing about this book is that you let God pour out his love through your hands and you wrote this awesomely well-written, too real book. May God bless your ministry of words and I hope I can read your next book. God bless you and your family! So as I always do, I will include my follow up email and his response. Because this guy is so precious. I just read and reread your email probably 7 times. Thank you for your kind words and encouragement! It’s like this payment from heaven. I am so rich right now because of what you just wrote in that email. You know, when I was writing the story, I kept feeling God urging me to finish and get this story out there for his children. Not because he wanted to teach his children something, necessarily, but because He loves his children (you) so much! Benjamin, he loves you so much. His discipline is so good. He is the best Father, disciplining and training his children like only he can. I have had to go through so much discipline in my life in order to have the wisdom to make choices that are according to God’s design. God’s wisdom is all throughout his design for love, marriage, and intimacy. I pray that you will trust his design and experience that joy and freedom that comes with it. He will pour out his love on you. But forgive me for preaching! I am just so happy that you enjoyed the book! May I quote your email on my blog? I love to share emails like this. Also, would you be willing to write a review of the novel? It’s so important for readers to know that the book is worth their time. It’s especially cool to have a guy’s point of view on the novel. I don’t think any guys have reviewed it yet. Thank you so much. You are so kind to send such an encouraging email. You made my day. God bless you and your family too, Benjamin! I’m sorry for any inconvenience you may had had reading my last email, because my first language isn’t English. You don’t know how that “preaching” you wrote to me touched my heart. Because those words were exactly what I was looking for. As I told you before, I can feel His love in your words. Of course you can quote my last email! I’m just really happy you could take your time to read my last email and answer me. Also, I will write a great review in the links you showed me. God amazed me and surprised me with Goodnight To My Thoughts Of You. I will recommend it to my English-speaking friends. I pray that someday your works can be translated into many, many languages. I pray also that God will continue to touch the lives of teens like me by reading your book. May God bless you in every facet of your life! P.S. By the way, I love to write poems and songs. Your poems in the book encouraged me to keep writing. P.S. 2 You made my day too. Go ahead and take a second to say a prayer for Benjamin to meet the most amazing, God-fearing gal in His perfect timing. It might not be for years to come, but I believe God wants to bless this guy and show him more and more of His amazing love through a marriage union. Heavenly Here With You, the second book in the Charlie & Miriam series, is in the works. Be sure to keep in touch so you can help me choose the book cover! More info soon. You can subscribe to the blog here to receive free email updates. Thank you and God bless you!